Tony Hicks has walked away from a most interesting scene, just when we thought he’d be front and center. Unfortunately, what made the scene so interesting in theory is probably what kept it from ever becoming a reality. Hicks leaves a lot on the table. He was named a captain for the 2015-16 season, was the leading scorer for the Quakers for the past two seasons and figured to be the greatest beneficiary of an offensive system under coach Steve Donahue that values efficiency through careful shot selection (i.e., shoot under the hoop or behind the three-point line). After all, Penn’s motion offense under Donahue’s predecessor and the man who recruited Hicks, Jerome Allen, never seemed to really gel from 2012 on. That also happened to be Hicks’ tenure with the program, which meant Hicks was one of many Quakers shuffled through far too many offensive rotations, taking possessions into his own hands when chemistry among his teammates otherwise failed at that end of the floor. Here was a golden opportunity under Donahue to watch Hicks thrive in a new system, one ostensibly geared toward taking some of the playmaking burden off of Hicks, likely emphasizing his three-point shooting (he shot 37.1 percent last season). But that expectation ignores the fact that Hicks liked to create his own momentum. He was good at it too. Hicks was an exceptionally quick backcourt weapon, relying on his own instincts to create his own tempo and shake off defenders on the perimeter. He was at his trademark best when driving to his left through the paint, drawing fouls and slicing defenses with ease. At his best, his intensity fueled stretches in which he was simply unstoppable. The integration of Hicks’ playmaking into Donahue’s motion offense was perhaps the most interesting on-the-court storyline in an offseason full of online casino them for a Penn program beginning anew. Perhaps, ultimately, that integration wasn’t promising enough for Hicks himself. The problem, though, is that Hicks never seemed like he was playing a role so much as he was playing his defender and putting the team on his back in the process. Hicks wasn’t selfish with the basketball, notching at least three assists in 10 games last season, including 13 against Lafayette. He was just instinctual, and maybe he was more comfortable with own instincts than Donahue’s. 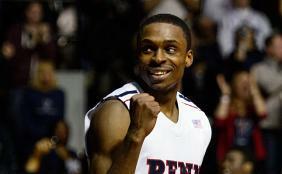 Penn will miss Hicks’ offensive heat greatly in 2015-16, that’s for sure. Hicks’ dominant stretches could span possessions, halves or even parts of a season. He averaged 19.7 points on 49.5 percent shooting in the final seven games of his freshman season, and then kept it going in the first six games of his sophomore campaign, averaging 19 points and 46.1 percent shooting in that span. Then Hicks scored one point in 13 minutes at Villanova in the next game. Then he shoved a Wagner player into press row once the Seahawks iced an overtime win at the Palestra in the game after that. Hicks reached 23 points four more times that season. He also made two field goals or fewer four more times that season. He was ejected for taking a swing at Lions guard Meiko Lyles during the second half of a 74-55 loss at Columbia. It’s fitting that this announcement should come the day before Halloween, as Hicks’ Penn career was always a trick or treat proposition. The trick for Hicks himself was keeping his cool, one he didn’t always pull off since he was suspended in each of his three seasons (one game in 2012 after a failed drug test and two games last season after he lost his temper during and after a home loss to Brown). But Hicks didn’t lack character, just composure. Now he’s got a fresh start after enduring three seasons in which the Quakers lost more than 70 percent of their games (26-61) and never reached their full potential. Expect him to go the same graduate transfer route that so many other Ivy standouts have gone recently. And expect Penn to benefit long-term from Hicks’ departure. If the disconnect between Hicks and the program’s new direction was so great that he walked away two weeks before the start of the season, it’s best that that We”ll see more of Penn”s offensive future now, however raw it might be. Let’s see more of junior guard Matt Howard, who finished third in scoring in his 24 starts a year ago. Let’s see five-time Ivy League Rookie of the Week Antonio Woods as a sophomore. Let’s see Darnell Foreman again, and Jackson Donahue and prime Ivy Rookie of the Year candidate Jake Silpe for the first time. This backcourt is wide open now, and so is Penn’s future. In the end it doesn’t matter. Penn is not a title contender as yet so it is not as if Maado Lo hurt himself and Columbia lost a title shot. We never had a shot. Sure, he makes the games more interesting but it is a new system and who knows how he would perform in it. He has always been an egotistical guy by his own measure. After his freshman year he declined the #1 he used to wear as a sign his growth and maturity. However it takes more than changing a uniform to actualize those qualities. My guess, he was no longer “The Man” and was not happy with that situation. The “sharing” the ball and assists comment by Donahue is very telling in that regard. Regardless, Hicks would be gone anyway in 2017. There are also plenty of guys in the backcourt already and the freshman can get more minutes. After all, they are the real future of Penn hoops and will need all the experience they can get before next year and Harvard’s “Super Friends” come online. Hicks is a great player when he wants to be, but he has always been loose cannon. I have never ever heard of a Penn player getting suspended for his behavior as much as he has. Personally, I don’t want a guy representing my school who takes a swing at an opposing athlete just because he gets frustrated. Stevie D also made it clear that he wants to recruit and coach “high character” guys. Although I’ve never met Mr. Hicks, I’m not sure, based on his prior behavior, that he falls into that category. Rebuilding will take time and patience, but I am confident it will come. While this was certainly a big surprise, at first glance, it is less shocking with each passing day. Given Coach Donahue’s comment on the style he wants the team to play (more inside and three point scoring), it did not appear that Mr. Hicks would be a primary option. If he wants to make a career in basketball, he would need to have a greater opportunity to showcase his skills. Going from the #1 option over the last 2-3 years to more of a role player position would be something for a person who is not planning on playing organized basketball beyond college, but not realistic for someone with greater dreams. In the end, it is a very practical and business-like decision from Mr. Hicks. Good for him to complete his degree and, most likely, move to another school as a Graduate Transfer. For Penn, the most the loss of Mr. Hicks will cause is an additional few losses in a season that was looking to be hovering around the .500 mark and 5th place in the Ivy League, at best. Besides, the goal is not one season but the growth of a program that has been approaching rock bottom the last several years. A few extra wins that could have been provided by the heroics of a Senior would not have done much to change the long-term success of Donahue’s tenure. The loss of Mr. Hicks will probably do more ultimate good than harm, since it will allow the Freshman and Sophomore guards to have a greater opportunity to gain experience. This, in addition to removing the most emotionally undisciplined player of the last three years should allow the players and this team to gain a new and more mature identity that fits its new coach.